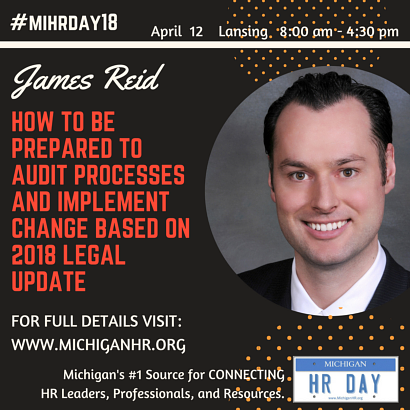 Michigan HR Day is so fortunate to have James Reid presenting again this year! Don’t miss one of our highest rated presenters! James Reid presents at local and national webcasts, podcasts and conferences regarding best employee handbook practices, strategies for franchisees and other non-union companies to comply with the National Labor Relations Act and respond to union activity. He has also authored several articles regarding strategies to update employee handbooks and challenge unemployment benefit claims. He has been elected Labor and Employment Law Section Council for the State Bar of Michigan and is a member of its Labor and Employment Law Section e-News Committee. He serves as the Director of Resource Partners at the Michigan Society of Human Resources Management (SHRM) and was previously Chair of the Oakland County Bar Association’s Employment Law Committee. He was named as a Michigan Super Lawyers® Rising Star from 2015 to 2017, listed as a 2017 and 2018 Top Lawyer by DBusiness Magazine, and is admitted to practice before the federal and state courts of Michigan. defended wage and hour audits and employment classification audits without any liability.